HOUSTON, TX—November 3, 2016—A subsidiary of RCI Hospitality Holdings, Inc. (Nasdaq: RICK) today named Shannon Glaser as Vice President of Franchise andConcept Development of thefast-growing Bombshells Restaurant & Bar chain. 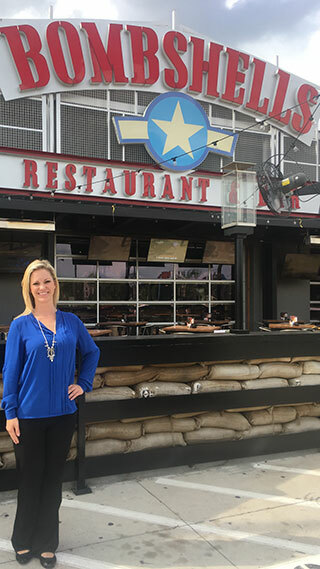 With more than 15 years of experience in all aspects of retail franchising, Ms. Glaser most recently was Senior Director of Franchise andDevelopment ofthe 78-unit Twin Peaks sports bar restaurant chain, where she was instrumental in the company’s growth. During her six and a half years at Twin Peaks, Ms. Glaser sold more than 120 franchise commitments,generating millions of dollars in upfront fees. To date, 50 of these units have opened, building Twin Peaks’ reputation as one of the nation’s fastest growing restaurant chains. Bombshells is the first military-themed chain in the sports bar/casual dining segment. It comes alive through its hangar-like design, attractive Bombshells Girls withmilitary inspired uniforms, full bar, scratch kitchen, big flat screen TVs, DJs and live music, huge patio, and energetic atmosphere. Attracting singles, couples, and families, Bombshells does a strong lunch, dinner and late night business. RCI has sevencompany-owned units open or under development. Franchises can be sold in all 50 states. For more information, contact Ms. Glaser at shannon@bmbfran.comor visit www.bombshellsfranchise.com. Ms. Glaser, 35, started her career in 2000 with Images 4 Kids, expandingthe family-owned children’s daycare photography concept to 100 franchisees, providing mothers across the country with the opportunity to own their own business with the flexibility to raise their children. She joined Twin Peaks In 2010, establishing its franchise department, and was accountable for the entire development cycle, including strategy, sales, awareness, and relationship management. Twin Peaks became a national brand,named to Restaurant Business magazine’s “The Future 50” list of fast-growing chains. Ms. Glaser graduated from the University of North Texas with a major in finance, and earned an MBA in Marketing Management and Global Business from the University of Dallas. She is a Certified Franchise Executive, issued by the International Franchise Association. All references to the “company,” “we,” “our,” and similar terms include RCI Hospitality Holdings, Inc. and its subsidiaries, unless the context indicates otherwise.